One of the two factors key to determining whether or not plesiadapiforms can be considered primates is to establish the phylogenetic relationships of the group to Euprimates. If some or all plesiadapiforms are sister taxa to Euprimates, then determining where to draw the primate/non-primate line depends only on taxonomic philosophy about whether to prioritize adaptive cohesiveness, a crown-clade model, or an apomorphy-based approach using some feature lacking in plesiadapiforms over a stem-based approach or a nodal definition that includes plesiadapiforms. If, however, some other group could be shown to be the sister taxon to Euprimates, or to be more closely related to some or all plesiadapiforms than plesiadapiforms are to Euprimates, the decision becomes more complicated and depends on the preferred pattern of relationships as well as the taxonomic philosophy employed. Wible and Covert (1987) argued that tree shrews are a better sister taxon to Euprimates than any plesiadapiform (Figure 2). As alluded to above, their view of the dental evidence linking plesiadapiforms to Euprimates was that it consists only of vague trends that are not unique in the broader context of Eutheria. Their study lacks, however, any attempt at a detailed analysis of dentitions. Discussion of the postcranium is similarly lacking, although this is more forgivable since the major revision of this material (Beard, 1989) was not completed until two years after their study was published. Wible and Covert's study was strongly biased toward the basicranium. It is rather ironic to compare this study to that by Cartmill and MacPhee (1980), who argued for the exclusion of scandentians from Primates on the basis of a similar comparative sample of basicrania. 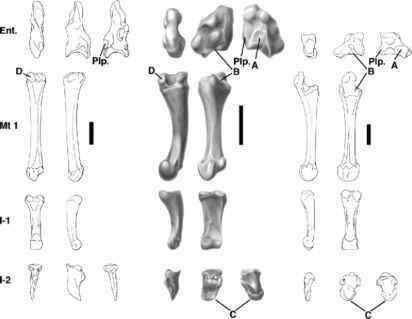 These earlier authors used plesiadapiform basicrania as the ancestral morphotype for Primates, based on the evidence from other systems. They noted the profound differences between scandent-ian and plesiadapiform basicrania, and concluded that the similarities between primates and tree shrews must, therefore, be convergent. Wible and Covert, beginning with much of the same data, essentially excluded the importance of non-cranial systems, and therefore came to a different conclusion. Obviously what is needed to form a consensus between these two approaches is an unbiased look at the cranial evidence combined with a detailed analysis of other systems. The possibility that some group other than Euprimates is most closely related to plesiadapiforms was advocated by Beard (1989, 1990a, 1993a,b) and Kay et al. (1990, 1992), who documented new postcranial and cranial material and interpreted it to indicate a tie between Dermoptera and at least some ple-siadapiforms. By demonstrating not only that euprimates and plesiadapiforms are very different, but also using evidence from multiple systems that the latter may have ties elsewhere, these studies seemed to toll a death knell to a euprimate-plesiadapiform relationship. This changed perspective was heralded as a major breakthrough in popular and non-specialist accounts (e.g., Martin, 1993; Shipman, 1990; Zimmer, 1991) and seems to have been broadly accepted by most anthropologists whose expertise lies in different areas. Careful reading of Kay et al. and Beard's studies reveals, however, a number of inconsistencies between the authors' viewpoints. Beard (1993a,b) considered plesiadapiforms, primates, and modern dermopterans to be linked in a mono-phyletic clade, Primatomorpha, to the exclusion of Scandentia and Chiroptera (Figure 3A). This implies that if one were willing to include Dermoptera in Primates one could include plesiadapiforms in Primates by simply equating Beard's Primatomorpha with Primates. Such a solution was indicated by McKenna and Bell (1997; see an earlier section). Beard also considered some plesiadapiforms (paromomyids and micromomyids) to be more closely related to dermopterans than they are to other plesiadapiforms, implying that Plesiadapiformes is only monophyletic if dermopterans are included. Figure 3. (A) Relationships of the taxa included by Kay et al. (1993) taken from Beard's (1993a) analysis. Beard did not explicitly include any lipotyphlan insectivores, implying that he considered them to lie outside of the ingroup. (B) Maximum parsimony cladogram found by Kay et al. (1994; redrawn from their Fig. 11). The only areas of congruence between these cladograms are the monophyly of Chiroptera and the relationship between Cynocephalus and Ignacius, with profound differences in the relative positions of both Scandentia and Primates (=Euprimates as employed here). euprimates and plesiadapiforms also differed from Beard's view. They considered Scandentia to be the sister group of Euprimates (their Primates), and placed plesiadapiforms and dermopterans outside of a clade linking Scandentia, Euprimates, Chiroptera, and even lipotyphlan insectivores. In this context there is no way to include plesiadapiforms in Primates without including all of Archonta, lipotyphlan insectivores, and any unsampled taxa that may lie in between the nodes represented on Kay et al. 's tree. This would be nonsensical, since it would likely include a significant proportion of Mammalia including rabbits and rodents at the very least (see a later section). This discussion reveals that although Beard and Kay et al. 's studies are often cited together as supporting the plesiadapiform-dermopteran tie, in virtually all other aspects their results are not congruent. Although Beard and Kay et al. 's studies looked at a broader range of data than had ever previously been brought to bear in a cladistic analysis considering the question of plesiadapiform relationships, there were nonetheless some holes in the sampling of both taxa and characters. First and foremost is the lack of dental data. Kay et al. included no dental data whatsoever, while Beard (1993a) included only a single dental character, the postprotocingu-lum, although he invoked unspecified dental evidence to link saxonellids and carpolestids with plesiadapids on his tree. In light of the fact that the traditional association between Euprimates and plesiadapiforms had been based on dental similarities, ruling out this relationship without considering characters from the teeth seems premature. This also substantially limited the taxon sampling with respect to plesiadapiforms, since the vast majority of species are known only from teeth. Although both Beard (1993a) and Kay et al. (1992) included at least some cranial data, they did not include any characters for plesiadapiform taxa outside of Plesiadapidae and Paromomyidae. The exclusion of the scrappy cranial material known at that time for Palaechthon nacimienti (Kay and Cartmill, 1977) and Tinimomys graybulliensis (Gunnell, 1989; but see MacPhee et al., 1995) is likely a product of the fact that very few cranial characters can be scored for either of these taxa. More surprising, however, is the exclusion of cranial material of Microsyopidae, particularly in light of the suggestion by Szalay et al. (1987) of a special link between microsyopids and dermopterans. At the time of the studies by Beard (1993a) and Kay et al. (1992), excellent cranial material for microsyopids was already well known (Gunnell, 1989; MacPhee et al., 1983, 1988; McKenna, 1966; Szalay, 1969). Beard's (1989, 1993a) study did incorporate all of the plesiadapiform postcranials known at that time. In this case, however, there were some holes in the character sampling. Particularly, postcranial features that have been used to unite Volitantia (Dermoptera + Chiroptera) were not assessed (Simmons, 1995; Simmons and Geisler, 1998; Simmons and Quinn, 1994).